How do I send Company Broadcasts? If you want to tell all your staff about something important that is happening, then you can send a Company broadcast which everyone will receive on their dashboard and via email. 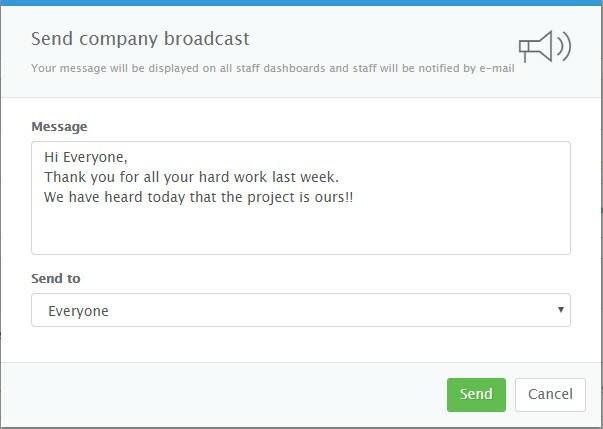 On your Dashboard, scroll down to your to do list and click on Send a company broadcast. You will then see a new dialog box where you can add your broadcast text and click on Send. How do I Export Data from Staff Squared? What Information can I find in my Company Calendar? Can I set up Multiple Offices? What Browsers does Staff Squared Support? What Information can I find in the Help Centre? How do I set up my Daily 'Who's Out?' Email Reminders and Slack Notifications?